Hey everybody. It's been another wild week for Humble and Fred Radio. Of course we're referring to the content deal that we signed with Astral Media last week, a deal that takes effect on Monday, January 21st when the podcast will be available on terrestrial radio. And that really is the point of this posting, to explain exactly what we're doing and why. We've received a ton of feedback from people since Friday who are under the impression that we're dumping the podcast to go back on regular radio. That's not the case. It's flattering that so many people are concerned, and love the podcast so much that they're actually pissed off at us, but here's the real deal. HumbleandFredRadio.com is going nowhere. It continues to be our top priority and absolutely nothing will change that. Humble and Fred will continue to arrive at their studios every day at 9:30 and will continue to record the podcast at 10:30 and continue to upload it "uncut" every day at noon. That will not change. What will change is what we do after we upload the podcast. We will prepare a terrestrial friendly edition of the show and deliver it to an FTP site where it will be downloaded by three Astral Radio stations in London, Hamilton and Toronto. In London it will air on Funny 1410 at 10pm. In Hamilton it will air on Funny 820 at 10pm. In Toronto it will air on Newstalk 1010 at midnight. In addition, all three stations will air weekend "best of" editions which means Humble and Fred Radio will be available on terrestrial radio seven days a week. Not only that, but Astral Radio plans to expand the syndication network in the coming months and our deal allows us to offer the show to anyone we want in markets where there is not conflict with Astral. Our plan is to be coast to coast on terrestrial radio was soon as we can. Needless to say, there are a lot of questions that come this, so we'll try to answer a few. Because this expands our brand and makes it much more attractive to our current and potential advertisers. A year ago, never did we dream that the podcast would be as well received as it has, but the concept is still foreign to many. By offering a sponsor the uncut podcast plus a terrestrial element it increases their reach and allows them feel more comfortable with the entire package. We expect to double our partners over the next few weeks, based solely on the Astral Deal, which is great news for fans of the podcast because it guarantees its survival. What happened to our relationship with Rogers? Unfortunately, we had to move on from Rogers but it was an amicable break because of the professionalism of Vice President of Programming Julie Adam. Still under contract to Rogers, we were approached by Astral and they offered a deal that was totally in tune with what our original plans were, to expand and syndicate. Rogers had right of first refusal and Julie had the Astral offer to respond to for the better part of a week, but in the end Rogers simply didn't have the vehicles available to offer us what Astral did. Vehicles being radio stations that were a good fit with the product we were producing. How does this differ from doing the morning show at Rogers K-Rock in Kingston? When we agreed to do the morning show in Kingston, it too was done with an eye towards syndication - but syndicating a live morning show is a lot different than syndicating a recorded comedy show and we quickly found out the logistics were somewhat complicated. Rogers was reluctant to go forward with more stations and we weren't interested in doing a morning show on one station so it was decided to end the Kingston experiment. Doing four or five minute breaks around seven or eight songs an hour no longer interests us. It's not what we want to do unless its on several stations at once with a lot more money involved. Were we fired by Rogers? Absolutely not, after discontinuing in Kingston we continued to appear weekly on the Fan and we continued to supply the podcast to Rogers digital platforms. Will we do anything else for Astral? Yes, part of our agreement is to be available for live appearances on Astral Radio stations, most notably Newstalk 1010. Astral plans to install an ISDN line in out Etobicoke studio so we'll be available to take part in other shows and features. Do we work for Astral? No, we are contracted to supply content and that's exactly what Humble and Fred Radio wants to be. A supplier of content to radio stations right across the country. Is there anything else in the works for Humble and Fred Radio? Yes, in the next month or so we should be able to announce the next move which will make the uncut version of Humble and Fred Radio available on yet another platform. Yes, we have never enjoyed anything in our careers as much as we've enjoyed putting Humble and Fred Radio together - and the response has been over-whelming, not only in daily downloads, but sponsor support and media support. Many said it couldn't be done, but we're making a living and we can now lay claim to the first Canadian podcast to become a radio show. Copyright ©2012. 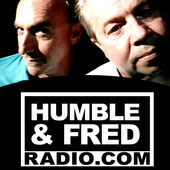 Humble and Fred Radio. All rights reserved.